Do the Key Stage 2 CD-ROMs come with animation? Our Key Stage 2 CD-ROMs have audio in place of the animation that we have on the KS1 books. The audio content is more in line with the 7-11 age range. 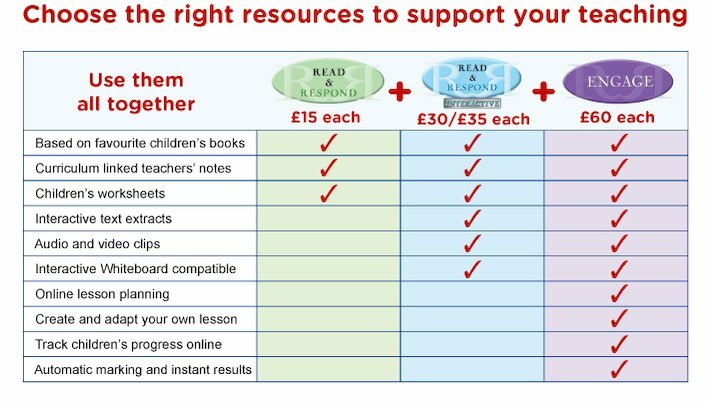 Teacher, Melissa Evans takes a look at the Read & Respond Interactive for us. This new resource has a lot to offer for both practitioner and children alike. The interactive CD-ROM helps to encourage not only language and literacy skills but also the opportunity to develop keyboard, mouse and navigational skills when using a computer. Importantly this resource can be used for individual, paired or group learning and is great to use on an interactive whiteboard. The children love to flick between the easy-to-use on screen menu and take great delight in re-telling the story by sequencing the pictures or by reading the extracts in turn. Children are able to engage in repetitive language when learning word patterns. It fosters the natural curiosity of words, through rhyming and sentence structure which are essential parts of developing competence when reading and writing. For practitioners, the CD-ROM offers accessible, supportive resources to enhance and extend a wide variety of abilities within the classroom. It provides excellent cross-curricular links which supports planning. Fundamentally, the CD-Rom offers a wealth of learning opportunities and insight into a book that is adored by many children. It enables children to learn through doing in a fun and illuminating way.